Poverty in India is widespread with the nation estimated to have a third of the world's poor. According to the a 2005 World Bank estimate, 42% of India's falls below the international poverty line of $1.25 a day nominal terms Rs. 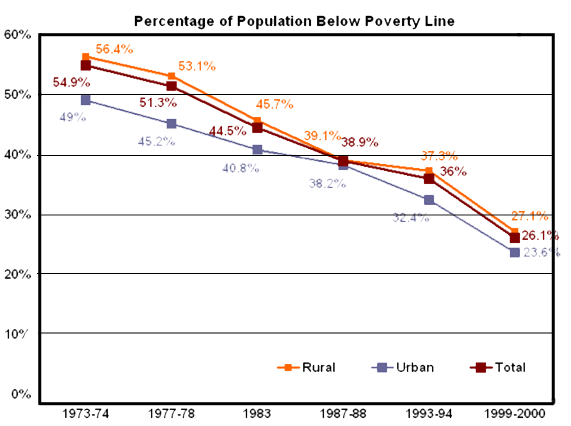 21.6 a day in urban areas and Rs 14.3 in rural area having reduced from 60% in 1980. According to the criterion used by the Planning Commission of India 27.5% of the population was living below the poverty line in 2004–2005, down from 51.3% in 1977–1978, and 36% in 1993-1994 While poverty rates in India are high, they are not on a par with what neighbouring Pakistan and Bangladesh experience. Among the causes ascribed for the high level poverty in India are its history undeBritish rule, large population, low literacy, societal structure including the caste system and role of women, dependence on agriculture, and the economic policies adopted after its independence. Since 1950s Indian government and non-governmental organizations have initiated several programs to alleviate poverty,ed access to loans, improving agricultural techniques and nate famines, cut absolute poverty levels by more than half, and reduced illiteracy and malnutrition. ndia's middle class has also seen large increases and is expected to grow to 40% of the population.